As we get closer to summer, more fun events are popping up. Enjoy the beautiful weather and head to any of these Bossier City events in May. Honor local military members during a special breakfast event. Join the Bossier Chamber of Commerce to recognize all the units of the military including, Air Force, Army, Marine Corps, Navy and National Guard. Tickets are $40 and $500 for a table of four with four military members included. For more information, go to the Bossier Chamber’s website. Immerse your family in the local arts on the first Saturday in May. Many Bossier schools will perform throughout the day. Ending with a special awards ceremony at 4 p.m. Also experience a live black light chalk artist paint three large landscapes. Celebrate Cinco de Mayo and the first anniversary of the Pelican Parlor, a local women’s clothing boutique. Enjoy different vendors, food, face painting, margaritas and prizes. Be one of the first ten in line and receive 25 percent off your purchase. Each customer will receive a free bath bomb with each purchase. 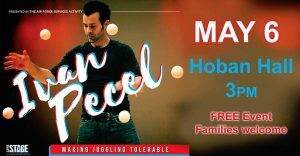 Watch as Ivan Pecel entertains and makes juggling interesting. Pecel is a star comedian who specializes in the talent of juggling. Encouraging audience participating, he blends his skills with clean humor. Hosted by Air Force Entertainment, this show is free and anyone with access inside the base is welcome to attend. Spend a Thursday night enjoying visual, performing and culinary arts. Wine, Art, Music will feature live tunes by Downtown Wave, art by Angie Brown Correla and Billie Brown with food pairings by 1800 Prime Steakhouse. Tickets are $35 and can be purchased at the door. If you love your motorcycle or enjoy looking at these special vehicles, catch the Vintage Motorcycle show at Bossier City Harley-Davidson. Amazing motorcycles featured throughout the day, plus food trucks. Enjoy live music by Landry and Company. Be sure to vote for your favorite motorcycle to honor the best of show. Treat your mom to a special brunch for Mother’s Day at Copeland’s Cheesecake Bistro. Make your reservations early for the special lady in your life. Enjoy $2 mimosas with a purchase of each brunch entree. 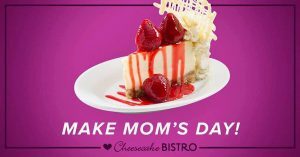 After all your mother’s done for you, be sure to treat her to a special piece of the cheesecake of her choice. Attend a Bird Walk in May at the Red River Wildlife Refuge. Wake up early to learn the facts of nature and experience the different species around Bossier Parish. Walks are about an hour and a half. This event is open to all ages and skill levels. Beginning at 9 a.m., join in on this community wide event for the fifth annual MemoriaBall. The United Community Foundation will offer free haircuts for children 18 and younger along with manicures and face painting. There will also be a basketball tournament, giveaways and plenty of opportunities for fun. Have you ever wanted to perfect your bowling skills? Sign up for private lessons by Gold Coach Susie Minshew. Spots are $120 for an hour and a half of lessons specific to your ability. Don’t miss the chance to learn the best way to get a strike or work toward being a professional at the sport. 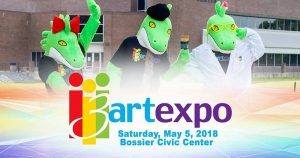 Don’t miss out on these exciting Bossier City events in May!